With wetrooms proving more popular in the last few years, we have been privileged to provide our customers with the choice of having exactly the wetroom that they desire. For instance, you can buy a wet room screen of 1850mm or 1950mm x 800mm off the shelf, but what if you need a screen to suit a custom shower tray of say 2000mm x 970mm? This is where Bespoke Glass Online's service comes into play, with our specialist ability to cut toughened and safety glass to your exact requirements. What if you need a shower door to fit an opening that was already in the bathroom or wetroom? Extend the wall to create an opening to suit an off the shelf glass screen, which means you will probably need a builder to extend the wall or stud, then a tiler to visit and tile the extended stud. Add the cost of tiles and materials and you could be looking at a cost of around £600.00 plus the cost of glass. Simply make the glass to suite the opening or aperture and save money. What if you need a shower screen to suit a wall that is out of square? We know lots of people have tried to fit an off the shelf screen with the hope that it will fit - with fingers crossed it might! However, we don't do fingers crossed, you simply send us the glass screen measurements that you require and we will cut the glass to the exact size and it will fit perfectly, without leaks and without lots of mastic! The summary of the benefits of fitting Toughened Glass that is cut to size rather than using off the shelf glass sizes. So in reality, fitting an off the shelf shower screen is great if you have an opening of the correct size, but you should not need to design your wet room to suit the glass. 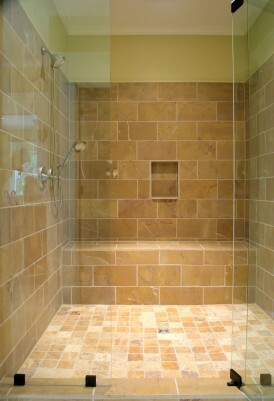 You really want to design or order the glass to fit your wet room. Bespoke Glass Online allows you to custom design your wet room to your specific requirements and simply order your toughened shower glass to fit your custom designed wet room! If you have some basic skill in DIY, there is no reason not to template. Please note that we supply home owners, builders, bathroom and wetroom installers, architect specified toughened glass, bathroom suppliers and interior designers. Why choose Bespoke Glass for your Shower Glass? We have used Bespoke Glass several times now and have always been impressed by the value for money that their glass products represent.